When Dana Alexander was tasked with creating a new and innovative space for kids at the brand new Hanover YMCA in Hanover, Pennsylvania she asked for some help. She didn’t want to do “the same thing everyone else was doing” and she knew it had to be top level, cutting edge and be multi dimensional. So she turned to one of the people she trusted most- her Lifefitness sales rep who had outfitted most of the fitness equipment in the new building. He in turn had one answer- call my friend at Exergame. And that she did! Dana actually had 2 locations she needed to outfit- an existing building where they wanted to convert an old cycle room into a group PT/teen based fitness center and the brand new YMCA teen fitness room. Her ideas combined with the product lineup and planning from Exergame led to two incredible installs, each featuring a slightly different focus. In the new building, Dana was looking to increase physical activity in their young members while keeping them engaged and having fun. So, Exergame went to their core product lineup with proven track records for doing just that: an Exerbike system with the “pedal to play” technology, a 3 Kick and the ever popular T-Wall 64. We had the privilege of being on site during their grand opening weekend to introduce the concept and equipment o the staff and members- and needless to say it was a huge hit. The second location, installed in the existing facility in the retro-fitted cycle room, was focused on functional training, small group personal training and use by teens. This room had to be slightly different to accommodate the different populations and multi-use it would receive. 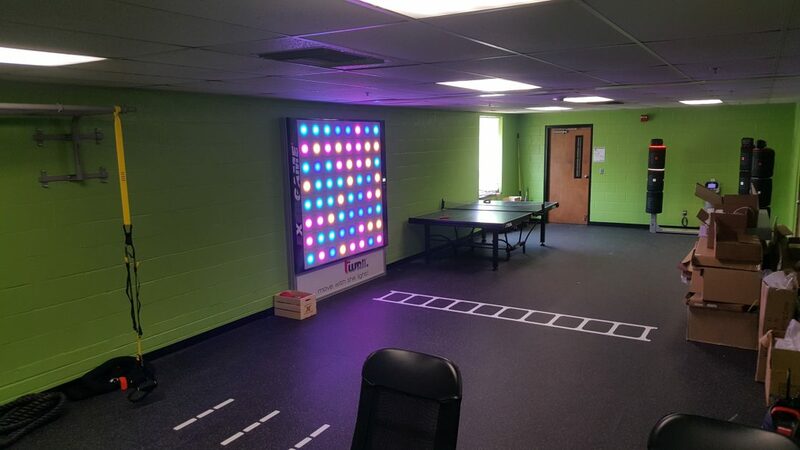 It was going to be more programming based, so in addition to interactive solutions like the T-Wall 64 and 3 Kick which can be used for speed, agility, quickness, reaction time, sensory perception, cognitive function and more- we added an integrated agility ladder in front of the T-Wall and a TRX multi-mount with station markings. These two additions give the room more program flexibility and diversity and add another level of function. Needless to say, the Hanover YMCA organization is at the forefront of developing healthy lifestyles for people at any age and ability. Their partnership with Exergame and their commitment to the community is proof of that, and we look forward to seeing how they continue to effect change for years to come. We salute you and thank you Hanover Y- and Dana Alexander- for giving us the chance to help you, help others. To see more pictures from their Littleston Branch, checkout our SmugMug Gallery here! For pictures from their South Hanover Branch, checkout our SmugMug Gallery here!